I originally listened to the Doors in an attempt to impress my first crush, but ended up getting hooked. Decades later they're still one of my favorite bands, primarily because of Ray Manzarek's inventive Fender Rhodes organ voice, which set them apart from the mass of pop-oriented and guitar-centric R & B/acid rock acts of the time. 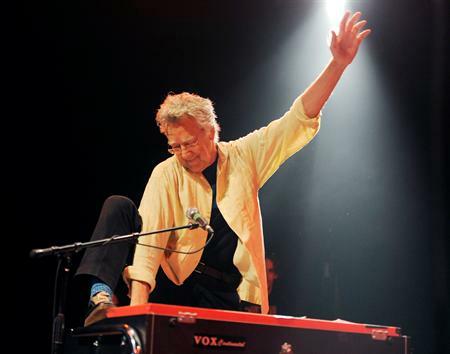 Manzarek had serious chops rooted in classical, jazz, and the blues he heard growing up in Chicago. The Doors had no bassist for most of their career, so Manzarek played both the bass lines and the keyboard parts that defined the band's vibe. And when Jim Morrison was out of commission, Manzarek handled vocals too. In just about any other band (i.e. a band without a one-in-a-million charismatic front man), Manzarek would have been the natural leader. Ray Manzarek is best known for "Light My Fire" from the Doors' debut album, in particular the instantly recognizable melody line that opens the song and the mesmerizing two-minute solo which starts at 1:14. Here he explains how this timeless tune originated in Bach, Coltrane, Latin music, and "Hey Joe." The keyboard work on "When the Music's Over" (off the Doors' second album, "Strange Days") packs a serious wallop, as can be seen in the live version below, from Copenhagen, 1968. The introduction is sublime. Manzarek begins on keys, adds bass, builds the tension for Jim Morrison's cathartic howl from hell, then slaps down big, bright chords as the full force of the whole band comes in. Throughout the rest of this epic number, Manzarek conjures a hypnotic bass line and the dark organ sound that glues everything together. The original incarnation of the Doors didn't last long, about six years from formation to Jim Morrison's death, but they went out on a high note with "L.A. Woman," released in 1971. Among the many great cuts was "Riders on the Storm," a song that had extensive FM radio airplay despite its seven-minute length. Manzarek graces the opening with resonant notes that fall softly, in perfect sync with the rain. He brings this delicate tone to the solo, which starts quietly at 2:41 and escalates into a blues fury. Manzarek closes the song by trading watery chord fragments with guitarist Robbie Krieger as the storm rages in the background. Few bands last five years, let alone forty-five. At 100,000,000 albums sold and counting, the Doors - and Ray Manzarek's distinctive keyboard stylings - promise to be around for a while. Wherever Ray is, I am forever indebted to him for the countless hours of bliss he gave me. If there is a heaven, Ray Manzarek is sure to be first chair, filling the clouds with celestial sounds. Wonderful tribute to the master, and great examples of his work. Thank you, Dan. Great ode to one of the all-time superstars who never gets enough credit (nor do The Doors). Riders on the Storm has to be one of the top progressive rock songs, right up there with Layla and Stairway to Heaven. I tracked the song on Spotify last year. They've got several different versions I'd never heard before including an earlier take. Apparently, it was the last song they did for the album...and the last song Morrison ever sang on. 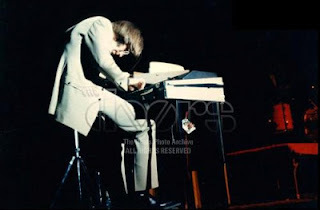 Very few keybord players left such an indelible mark on rock and pop music such as Ray Manzarek did. True talent indeed! That Light My Fire iintro always gets everyone's attention. And on Riders On The STorm, the piano literally creates the image of rain trickling down. Music ruled back then, not the video. Luna Lee transforms "Voodoo Child"